“Green” Firm Gets Subsidies to Sell Solar Panels to Itself! A small corporation called St. Clair Solar owned the wind farm and was the Canadian company buying First Solar’s panels. 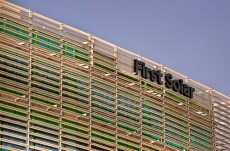 But St. Clair Solar was a wholly owned subsidiary of First Solar. So, basically, First Solar was shipping its own solar panels from Ohio to a solar farm it owned in Canada, and the U.S. taxpayers were subsidizing this “export.” . . .